If the hectic festive season has left you a little 'meh' about life, here's a gem that promises to help you feel awesome. 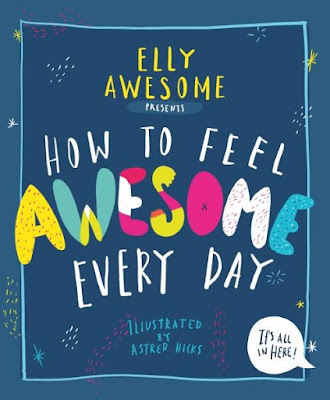 Created by vlogger and television presenter Elly Awesome, this busy and vibrant tome is peppered with helpful tidbits on keeping positive, uplifting quotations and easy-to-read snippets of truly awesome advice. It's jam-packed with all sorts of inspiring thoughts and activities, from seasonal bucket lists, stretches and exercises to lists of Random Acts of Kindness, craft activities and recipes. My favourites are the pages on designing your own superhero and putting together your own list of Awesome Anthems. The illustrations are full of life and colour, while the text has the bright and breezy tone of a chat with a close friend. It's about celebrating the simple stuff, creating your own good times and taking care of yourself and others. Not a bad way to make yourself feel awesome. Plus, if you're still feeling a little blah, there's also a page where you can Get It Off Your Chest. This makes a wonderful workbook for girls and adolescents to help battle boredom and brighten their mood.